Content: It’s a huge book, which will be daunting. But 2/3 of it is pictures. And the text section may be a big confusing for younger readers. There is some smoking by adults, but other than that, there’s nothing that would stop me from giving this to a precocious 9- or 10-year-old. It will be in the Middle Grade (grades 3-5) section of the bookstore. I don’t usually like to write about books months before they come out. But, since this is the first one I finished for the 48 hour book challenge, I figured it was okay. I’m also going to be coy and not tell you too much about the book. I knew very little about it going in, and I think that’s the best way to experience it. That said, I liked this one nearly as much as Hugo. It’s about the theater and family and truth in storytelling. 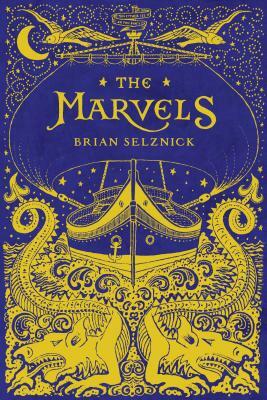 Selznick’s art is gorgeous, as always, and even though the text section starts out a bit confusing, stick with it. It’s completely worth it at the end. Oh: and read the afterword. It makes everything that much better. There’s really not much else to say, except: I can’t wait to share it with everyone else. My kids love his other books so we'll have to add it to our TBR piles. I can not wait to read this one. I don't know much about it yet either and plan to keep it that way. Ahhh…so jealous you've already read this one! Can't wait for it!